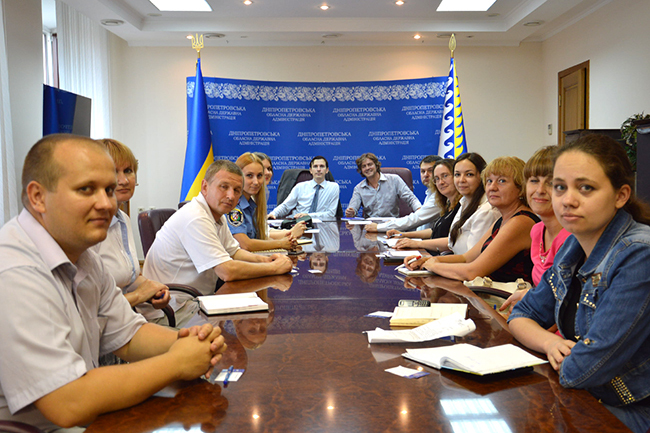 A constructive meeting was held between EUAM’s communication experts and the communication officers from most of Regional public entities: the representatives of the Head of Administration, the Regional Council, the Regional Police, the City Police, the Prosecutor’s Office, the Appeal Court, the District Administration and Municipalities participated in the event, that was largely covered by the regional media. The purpose of the meeting was to advise the institutions on how to communicate in a strategic, transparent and interactive manner in view of building trust with the public. The parties agreed on an open follow-up debate with the EU interlocutors on the role of media in this delicate and historic post-revolutionary transition for Ukraine, with its reforming tools and institutions coping with civilian security, law enforcement, human rights and the fight against corruption. The institutions face a major problem in restoring people’s trust. The meeting disclosed a promising response from some of the main actors of change, e.g. regional media professionals themselves.